Can you please describe the operational peculiarities of the two borders that the BSF is guarding? The Border Security Force (BSF) is guarding the borders with Pakistan and Bangladesh. For any force, operational preparedness and effectiveness is of paramount importance. When it (BSF) was created there was no Bangladesh. We were guarding borders with both the eastern and western Pakistan. The BSF was created in 1965 because Pakistani regular army had intruded into India, and the state police forces guarding the borders then were no match for them. 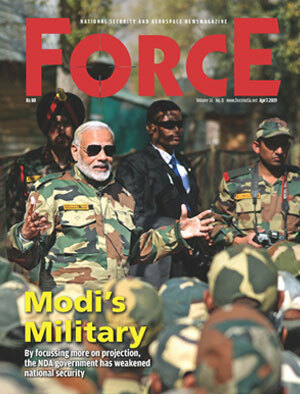 Therefore, a need was felt by the central government to raise a professional border guarding force on the lines of army. That is how the BSF came into existence on 1 December 1965. Starting with very limited numbers, we have now grown into very large organisation. During this journey of more than 50 years now, we have been assigned various tasks. For example, we were given the task of fighting militancy in Punjab. Then, we were tasked to fight Separatist movement in Jammu and Kashmir in the Nineties. In both these operations, the BSF played a very important role and was successful in completion of the task given to it. What are the primary challenges on the borders the BSF is guarding? We have challenges of different kinds on both the borders. For example, on Pakistan border we have difficulty of terrain on one hand, especially in the Kashmir region, where temperatures drop as low as minus 40 degrees. On the other hand, there are operational challenges of infiltration on the Line of Control (LC). In Jammu, there are problems of riverine terrains and nullah (stream) gaps. Of course, infiltration is a challenge there as well. In Punjab, the big challenge is drug smuggling. In Rajasthan, a part of the Thar desert, gets very hot in summer with the temperature rising to as high as 50 degrees. Then there is the Rann of Kutch in Gujarat, a marshy and creek area. In the east, we are faced with thick forest cover infested with mosquitoes causing Pf (Plasmodium falciparum) and Pv (Plasmodium vivax) type malaria, which is fatal if not attended to within 24 hours. Operationally, the border with Bangladesh is very large, about 4,100 km, out of which roughly 900 odd km are riverine and not fenced. Therefore, it has its own issues and problems. There are issues of cattle smuggling and illegal migration from the other side. But through our deployment, vulnerability mapping, deployment of water crafts and technological solutions, we are managing the border and, to a large extent, we are in a position to contain the impacts of these issues.